Theo Robinson struck two minutes from time to earn Derby a point and deny Eric Black his first win as caretaker boss of Blackburn. Jordan Rhodes, Rovers' £8m summer signing, looked to have secured the points for the away side with a volley. But the Rams snatched an equaliser when Robinson bundled home from close range in the 88th minute. Blackburn remain unbeaten away from home in the league this season but have now gone five games without a win. The point leaves Rovers 10th in the Championship with 17 points from 11 games, three points and four places better off than Derby. Blackburn caretaker boss Black, who was put in charge of the first team after Steve Kean was 'forced to resign' at the end of last month, opted to relegate captain Danny Murphy to the bench. They lacked a cutting edge in the opening half-hour and the closest they came was from a couple of Morten Gamst Pedersen free-kicks. In the 34th minute the visitors took the lead as Colin Kazim-Richards chipped towards Pedersen, whose cushioned header found Rhodes in support and he waited for the ball to drop before firing home first time from 20 yards. It was his sixth goal of the season. Derby served warning that they were far from a spent force in the game when Craig Bryson fired over from 10 yards before Paul Coutts curled an ambitious effort on to the roof of the net. County continued to press but had to wait until late for the equaliser as the energetic Bryson drilled low and forced an impressive save from Paul Robinson, with his namesake following up to convert from a tight angle. Derby boss Nigel Clough: "I said to the players that we have to be at 100% maximum to compete with these teams because of the quality they have. "They had an absolutely brilliant goal out of nothing, which is what you get for an £8m striker I suppose. But in the end a draw was deserved if only for the second half, not the first. "We were nowhere near good enough in the first half but we felt the pressure was building and in the last 20 minutes to half an hour we just about deserved it." 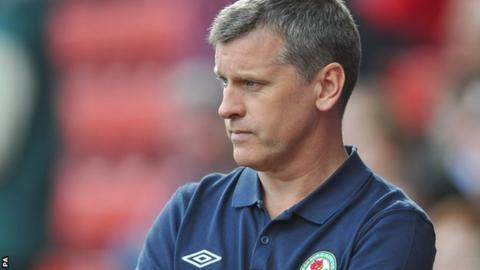 Blackburn caretaker boss Eric Black: "I haven't been told [how long the appointment will take], I'm not involved in the process. "I'm employed by the club and I continue to give it my best shot to ensure the team prepares in the right manner and that is what I'll continue to do. "I can't enlighten you really because I have no idea. I do know the the owners expect me to carry on preparing the team and I think I have enough experience to do that."